Synopsis: Penny is sick of boys and sick of dating. So she vows: no more. It's a personal choice. . .and, of course, soon everyone wants to know about it. And a few other girls are inspired. A movement is born: The Lonely Hearts Club (named after the band from Sgt. Pepper). Penny is suddenly known for her nondating ways . . . which is too bad, because there's this certain boy she can't help but like. . . .
Where was Penny when I was in high school? I, for one, could've used a Lonely Hearts Club. What girl would turn that down? The book immediately jumps into Penny's failed relationships. What's great about this is she doesn't sit there and feel bad about herself. She mentions them, they come up every now and then and it's over. And instead of sitting around and moping, Penny creates The Lonely Hearts Club. At first, her friends think she's crazy. What high school girl would willingly give up dating for the rest of her high school career? But shortly after, girls turn to Penny and her club. The club is about being there for your friends, helping each other out and not letting boys affect your life. The catch? 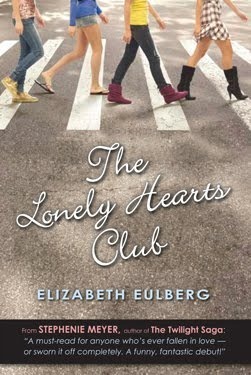 As soon as the club becomes popular, Penny finds herself defending her club against the boys at her school. And, if that wasn't enough, she starts falling for her friend's ex-boyfriend. Dilemmas, dilemmas! I'm a huge Beatles fan and this book is packed with Beatles goodness. There are 4 (I think) sections, all divided into certain Beatles songs. Each song relates to what Penny is going through. The way it's done and the cute art inside the book is definitely a plus! To all you eReader peeps, I recommend buying the physical book. At least in this case. You'll be missing out otherwise. And lets get to swoon worthy males. Ryan is a great candidate, but I don't know. There wasn't ENOUGH Ryan. The book revolves around girl power and friendship, so I get the reason why. I just wish there was more Ryan. I would've liked to get to know him better. And where were guys like him when I was in high school? Or even now! Seriously, I miss the gentlemen movement. Okay, Beatles-ness and swoon-worthy Ryan landed this on my TBR. Thankies! I seriously have crazy book issues. I've been meaning to read ALL these books, but then something else catches my eye. I look it up on goodreads and end up buying/reading it. I've been wanting to read this book for a long time now because it sounds so good and has such a different plot line. I think the whole-lets start a club-thing would be fun to read about and I like that the author put the Beetles in the book. Great review! Thanks sweetie! Seriously, where was Penny Lane and The Lonely Hearts Club when I was in school? I could've used that! Hahaha, has anyone else noticed the Stephenie Meyer is recommending pretty much EVERYTHING? I just wanted to point that out!